Practical blower function - Where vacuuming is not possible, the practical blower function can be used. Effortless dirt removal, e.g. from a gravel bed. Practical parking position - Quick and easy intermediate parking of suction tube and floor nozzle during working interruptions. Practical cable and accessory storage - Space-saving, secure and easily accessible suction hose, power cable and accessory storage. Pull & Push locking system - For quick, easy and safe opening and closing of the container. Ergonomically-shaped carrying handle - Device is easy and convenient to transport. Compact construction style - Flexible and versatile use. Space-saving storage. 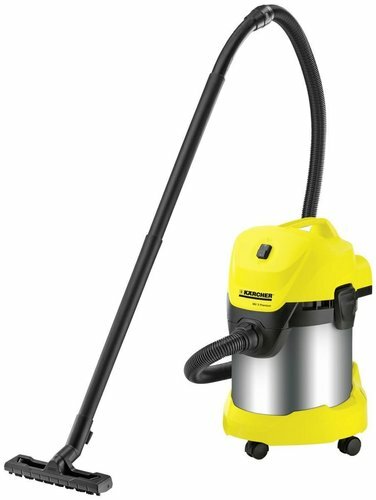 I have used this new vacuum cleaner a few times now and while it is powerful and strong, easy to move around- the bag system is a nightmare. The inside bag is already torn, and after emptying it, you will need to take a shower. There are also small parts that need to be removed to clean the filter, and if that thing gets lost... you will have no vacuum cleaner. havent tried its wet function yet, but someone said I should try putting water in the drum to catch the dust. It also puffs out dust on start up, after cleaning.